We’d love your help. Let us know what’s wrong with this preview of The Prince's Special Bride by Devika Fernando. Prince Christian has no place in his life for love or for a woman who do Marie doesn’t believe in fairytales and needs no handsome prince to rescue her from misery – but everything changes when she falls in love with Crown Prince Christian of Taragonia. When his sister invites Marie to the palace, their lives collide and leave them both fighting their forbidden attraction. This is a full-length book of more than 83,000 words, and there are two chapters of bonus material added at the end. The romance novels of this series are reminiscent of bestsellers by Nora Roberts that also involve irresistible princes bent on making an exception to the rule. Each book in the series can be read as a stand-alone with a 'happily ever after'. There are no cliffhangers, although some characters will reappear in the sequels. To ask other readers questions about The Prince's Special Bride, please sign up. I picked up a Devika Fernando after ages. The characters, the setting, the conflict - super; the language - great; and the editing - good. If I have to pick one person, I choose the Queen mother as the character that I enjoyed the most. She is indomitable, formidable, and unflinchingly regal. Good job indeed. The love story between Marie and her fabulous prince is sweet and completely en I picked up a Devika Fernando after ages. The love story between Marie and her fabulous prince is sweet and completely engrossing. The un-love story of the Prince's sister, Olivia, is sad, but the next book is about Olivia finding her prince too. The end of this book offered a free prelude to Olivia's story and I know what I am reading next! 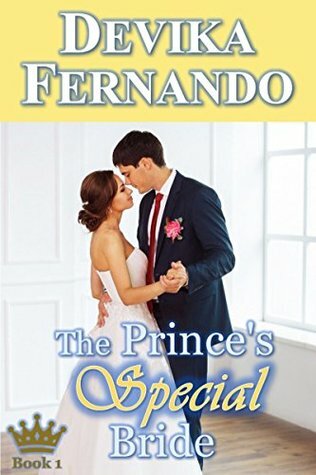 For today’s post I wrote a book review for author Devika Fernando’s first book in the Royal Romance series, The Prince’s Special Bride. Before I start, I just want to warn you that the novel triggered some mixed feeling inside me, so bear in mind that there will be also some negative aspects I will outline from an honest reader’s point of view. If you have different opinions, at least respect mine. Marie Kemei works as a night manager at a resort on Kuramathi Island, in the Maldives, but her life is about to change drastically when she finds Olivia, the runaway Crown Princess of Taragonia. She was hiding from her family because they were forcing her to enter an arranged marriage with the Crown Prince of Visteria. If this wasn’t bad enough, Crown Prince Christian of Taragonia, Liv’s brother, shows up and the salty air becomes heavier with mutual attraction between Marie and Christian. Later on, Princess Olivia arranges a trip for Marie to come to Taragonia to assist the future bride as a dear friend and bride’s maid, but this also means that Christian and Marie will meet again. How will this modern Cinderella adapt to royal life in order to find her ‘happily ever after’ by Prince Christian’s side? I have to admit that the main reason I picked this book up was because of the premise. It had been a long time since I'd read a royal romance, especially one between a commoner and a prince (a Cinderella story of sorts), and this book seemed like the perfect choice to correct that. Though to be clear, Marie is no damsel in distress, who needed a prince to rescue her. On the contrary, she is a fiercely independent, passionate woman, who has a mind of her own. However, when Prince Christian came alo I have to admit that the main reason I picked this book up was because of the premise. It had been a long time since I'd read a royal romance, especially one between a commoner and a prince (a Cinderella story of sorts), and this book seemed like the perfect choice to correct that. However, when Prince Christian came along, and circumstances led her into the world of royals, she was tested in a way she never thought she will be, and she had to learn to adapt to her new environment, all the while fighting the forbidden attraction to the Crown Prince. Christian on the other hand, was born and bred to be a ruler. Everything he did was to benefit the crown and his people. He was the much loved Prince of his country, who prided himself on his spotless reputation and self control. That is until Marie came into his life, and all that hard-won control went right out of the window, 'cause true love is all-encompassing like that. The one thing that stood out about this book was the characterization. The author did a fabulous job sketching out the protagonists, and the alternating narration gave the reader the opportunity to get to know and connect with them both. The only complaint I have is that the sizzling chemistry between the protagonists seemed to peter out as the book progressed, but I am possibly being overly greedy here, because the author did do a wonderful job of portraying the deepening bond between the two. I guess I just wanted more of the sizzling passion too. Finally, the copy I read could use another round of proofing. However, it did not impact my enjoyment of the story as much, because it was a tale well told, which is what is more important. All in All: I would definitely recommend this book if you enjoy this genre, as Devika Fernando writes the sweetest, most heartwarming romances, and this book is no exception. Disclaimer: I was given a copy of this book in exchange of an honest review, but all opinions, as always, are completely mine. Devika Fernando’s ‘The Prince’s Special Bride’ is a feel good romance with the right blend of intrigue, romance, lust, twists and turns, all set in a glorious royal setting. Cover: I don’t usually judge a book by its cover, but a romance where the damsel is of exotic origin and her Prince Charming is that exciting, the cover is a bit tame. Christian: After a very long time, I fell in love with the male character of a novel! Crown prince Christian is one to sweep you off your feet. Dign Devika Fernando’s ‘The Prince’s Special Bride’ is a feel good romance with the right blend of intrigue, romance, lust, twists and turns, all set in a glorious royal setting. Christian: After a very long time, I fell in love with the male character of a novel! Crown prince Christian is one to sweep you off your feet. Dignified, wise, sensitive, calm and in control of situations, he is also realistically vulnerable. Oh, and a real stunner looks-wise! A real man this! Marie: An exquisite blend of exotic beauty, charm and girlishness. At times insecure about her own background and ethnicity, she still maintains a poise that is endearing. Olivia: Elegant and graceful, the fun-loving princess caught in the web of duties. One can’t help loving her! The Queen: The authoritative, stoic, regal, non-compromising matriarch. She is portrayed so well! The author has woven a spell-binding love-story that is timeless in its essence. The rich boy meets poor girl track, with its share of road-blocks, heart-breaks, stolen kisses and more in a wonderful royal setting. She transports you to a whole world of royal palaces, decadent wining-dining and luxury amidst a believable modern setting. The royal kingdom of Taragonia throws challenges at a simple yet beguiling Marie. The slow build-up of romance and the sizzling chemistry between Marie and Christian is beautifully done. The sensual journey seemed a tad restrained and could have been a bit more lingering. A detour that sounded like a promising romantic getaway proves to be a dampener of sorts. But I guess, that is the power of the author's story-telling! Wanting the reader to root for the protagonists, swear at the naysayers and sigh at the tenderness of a powerful ruler towards a commoner, one he’s hopelessly fallen for because of her uncommon traits. I had a bit of a rough start with this story as romance and fairy tales are not my usual genre, but Devika Fernando's compelling story telling spurred me on to a very entertain read indeed! Night manager and ordinary islander Marie doesn't need a knight in shining armour to rescue her from her misery. Not that she is miserable, just that having a loving companion doesn't hurt. In comes waltzing the handsome and smart Prince Christian of Taragonia. Sparks fly right from the start and she ends up accepting an invite to stay with Prince Christian's sister and her friend, Princess Olivia. Things go from bad to worse, thanks to the media and a fact that Marie is a commoner. Does this fairy tale involving royalty have a happy ending? Kind of looks a bit too ordinary for this extraordinary and well written tale. I would have preferred something a bit exquisite! ​Well-balanced would be the word to describe the characterization. In the initial part of the story, the writer focused on Olivia's character and then gradually progressed to Marie's and Christian's character. She weaved little sub stories to bring in the human side of a character which was touted to be a stoic royal. However, one such sub story (where Christian flies over to Africa with Marie to find her parents but ends up saving people caught in floods) seemed little deliberately written to give depth to the character. Nevertheless, this didn't hamper the plot's flow. The characterization, the plot line and the writing in general were flawless. The romance between a commoner and a royal was written with a good sense of reality. Immaterial of the times we are in, a relationship between a person from the lower rung of the society in terms of income and stature with that of some one from the upper crust of the society doesn't not sit well. Civilization is yet to progress to a state where two people can love each other without having to think about their stature in the society. It is evident that the writer has researched well to sketch the characters and relationships between modern day royals and commoners.Thankfully she didn't portray the royals as people with way too much money which they flaunted meaninglessly. The writer chose the traditional method of scaring off a character to abandon the relationship - The case when media wrecks havoc in the relationship of a celebrity. I would have rather preferred an actual fight or argument between the protagonists. Just my perspective! A sweet and heartwarming story that transports you to a fairytale like setting. I loved Marie and Christian(although in my mind, he's way hotter than the cover model!). Olivia turned into quite a firebrand. I'm definitely looking forward to reading her story next. The characters are well sketched out. You could feel you are each one of them and understand them perfectly. Like Ms Fernando's other books, this is a sweet romance with characters you'd like to have for a friend. The story is a lovely take on Cinderella, with the protagonist not only from a different country but also a different culture. Accidentally befriending an incognito princess doesn't happen everyday, but hotel night manager, Marie, cares about people, and when she hears someone hidden in her special tree house, sobbing, it is inevitable she will try to make the young woman feel better. Christi Like Ms Fernando's other books, this is a sweet romance with characters you'd like to have for a friend. The story is a lovely take on Cinderella, with the protagonist not only from a different country but also a different culture. Accidentally befriending an incognito princess doesn't happen everyday, but hotel night manager, Marie, cares about people, and when she hears someone hidden in her special tree house, sobbing, it is inevitable she will try to make the young woman feel better. Christian's arrival in search of his sister, the princess, offers both siblings a chance to revel in a day of freedom away from the press in Marie's company. It's a case of instant attraction and one stolen kiss before the royal siblings are whisked away to their small, fairytale Mediterranean kingdom. Several months later, Marie receives an invitation to a royal wedding. Nothing is as she expected, and Marie soon finds herself the centre of attention. I had read a series of royal tales by Nora Roberts and have been hooked since then. When Devika Fernando announced her Royal Romance Series, I was awed. I couldn't wait to get my hands on The Prince's Special Bride. This is the story of Marie who is illegitimate and has African blood. The story is about her and Prince Christian of Taragonia. They fall in love. His mother, the Queen, disapproves. Will they be able to get together? The author has woven an interesting tale giving the reader glimpses I had read a series of royal tales by Nora Roberts and have been hooked since then. When Devika Fernando announced her Royal Romance Series, I was awed. I couldn't wait to get my hands on The Prince's Special Bride. The author has woven an interesting tale giving the reader glimpses of palace life in modern times. A special kudos for that. Marie is a strong character and admirable. Prince Christian could have been stronger, especially considering that he's being trained to be the future king. The Queen is someone I could visualise. She's been etched superbly. Olivia, Christian's sister, is another character I liked reading about. Though the pace lags a bit midway, the last fifty pages more than compensate for that. All in all, a lovely book that truly inspires me to pen my own series. A great royal romance to spend couple of hours with! The women characters of Devika Fernando in the Royal Romance Series are today’s woman who have their heart and head at the right place. Loved them, both Marie in Prince’s Special bride and Olivia in Prince’s Stubborn Wife. They know exactly what they want from their life and know to expand their sight to a greater good as well: Strong yet soft women of substance. Prince Christian is a complete Mr. Perfectionist. His silent brooding and controll A great royal romance to spend couple of hours with! They know exactly what they want from their life and know to expand their sight to a greater good as well: Strong yet soft women of substance. Prince Christian is a complete Mr. Perfectionist. His silent brooding and controlled nature steals your heart the moment he appears watching silently his sister and the attractive exotic stranger with her. Christian and Maria with a strong sense of righteousness and the well-being of Taragonia will leave you warm towards the couple: A great romance to cuddle with this winter. Devika Fernando's writing is very vivid and takes you to the world she has created every time. Marie, the pragmatic night manager at a resort in the Maldives befriends Liv, one of the mysterious guests in the resort. Her brother Christian comes in pursuit of Liv and the three form a special bond. But Marie is in for a surprise as Liz is Olivia, the princess of Taragonia. Marie receives an invitation from Olivia to be her special guest at the palace while she prepares for her wedding. What happens the Devika Fernando's writing is very vivid and takes you to the world she has created every time. What happens there? Will she be able to fight the attraction she feels for the prince? Will her controversial past, mixed race and insecurities become the stumbling blocks in the path of her dreams? How does Christian react to Marie's presence at his palace? A wonderful and enjoyable sweet romance. Her characters are always so real, you can't help but love them and need to know what happens next. The prince is of course drool worthy and charming. Marie is so real, so strong, intelligent, kind, fun, and a bit sassy. I Love the fact that her heroines are always strong and brave women that don't need to be rescued. I truly Love the exotic and the royal settings in this book. I look forward to reading more soon. A light hearted romance amidst royalty! What more can a reader ask for? The characters have been etched well. Loved the strong and dynamic Marie. Christian the prince is drool worthy! What actually put me in awe was Olivia the sister of the prince. She was a lovely matchmaker. Looking forward to the next in the series. Out of all the 'Romancing the Royal's Book series', this one was the best. It had all the shades of conflicts-very unique and interesting. Marie is courageous and indeed special. And prince is really royal and handsome. I loved the characterization of both the lead pair. I would recommend the series to all romance lovers who want a larger than life setting blended with real life values. This is the first time I am reviewing a book by Devika Fernando. I have always been intrigued by her books, especially the Royal Romance series. I suppose at heart and we are all looking for our Prince Charming, even as we fight for equality. Devika has created a perfect blend where this longing for the prince is matched with an equally strong independent streak in the heroine. Devika has a very easy style of writing that makes it easy to slip into the story. Her characters are human rather than perfect. She has a knack for putting things in a way you would like to quote. All in all, I enjoyed reading it, though the book could have been edited better. It will go well with the rains and a nice cup of tea. The Prince's Special Bride is the first in the Royal series by author Devika Fernando. It's a lovely take on the Cinderella story. Marie is like any other girl and easily relatable. At the same time she's intelligent and has a core integrity. Even when swept away by the fairytale surroundings of the palace, she retains her doubts and treads carefully. She is honest and tells the Prince upfront he shouldn't try to change her. The attraction between them is sizzling. However, it is just the book f The Prince's Special Bride is the first in the Royal series by author Devika Fernando. It's a lovely take on the Cinderella story. Marie is like any other girl and easily relatable. At the same time she's intelligent and has a core integrity. Even when swept away by the fairytale surroundings of the palace, she retains her doubts and treads carefully. She is honest and tells the Prince upfront he shouldn't try to change her. The attraction between them is sizzling. However, it is just the book for lovers of sweet romance. I wish Marie had made an attempt to save Olivia from the obviously bad match since they were such good friends. But Olivia's story is the next in series so the author probably has reasons for not bringing that about. Christian as the prince is as dashing and suave as they get but with a surprisingly sensitive side. Marie, our heroine, charms the socks off you from the word go! She is beautiful and intelligent, sensitive and honest. And yet, Marie is real, and therefore very relatable. I loved Liz too. And so is Christian! Devika has a way with her words. Her language is impeccable, a perfect balance of simple and exotic. She sketches the characters beautifully and describes the minutest details in a scene so crisply, you'd almost feel you are right there, standing next to the hero and heroine! There's nothing better than falling in love with someone and finding out he's a prince who will one day become king....enchanting story, well told, and fascinating in the reveal. Do yourself a favor and buy this book!! When marie was working as a night manager she ran into a young lady crying and hidden not asking too many questions she got to be quick friends with the lady known as liv. But when her brother came sparks went off. At the end of their visit she found out why they both were so secretive and her life as she knew it was never again going to be simple. Almost as soon as Devika Fernando could write, she imagined stories and poems. After finishing her education in Germany and returning to her roots in Sri Lanka, she got a chance to turn her passion into her profession. Having lived in Germany and in Sri Lanka with her husband has made her experience the best (and the worst) of two totally different worlds – something that influences her writing. H Almost as soon as Devika Fernando could write, she imagined stories and poems. After finishing her education in Germany and returning to her roots in Sri Lanka, she got a chance to turn her passion into her profession. Having lived in Germany and in Sri Lanka with her husband has made her experience the best (and the worst) of two totally different worlds – something that influences her writing. Her trademark are sweet, yet deeply emotional romance stories where the characters actually fall in love instead of merely falling in lust. She draws inspiration from everyone and everything in life. Besides being a romance novel author, she works as a self-employed German web content writer, as a translator, and as a faithful servant to all the cats, dogs, fish and birds in her home. What she loves most about being an author is the chance to create new worlds and send her protagonists on a journey full of ups and downs that will leave them changed. When she’s not writing, she’s reading or thinking about writing.